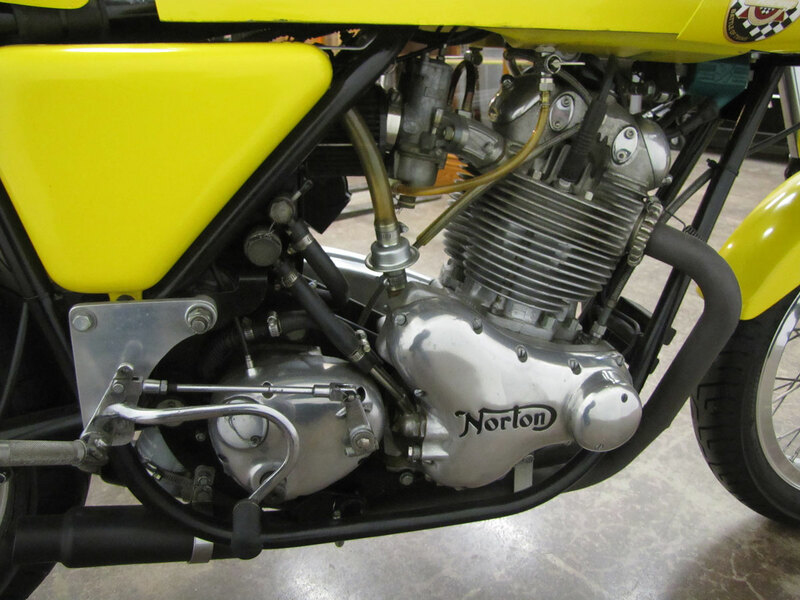 Probably most famous for its “featherbed” Manx Norton, the Norton works in England always focused on solid chassis designs, built for road racing. 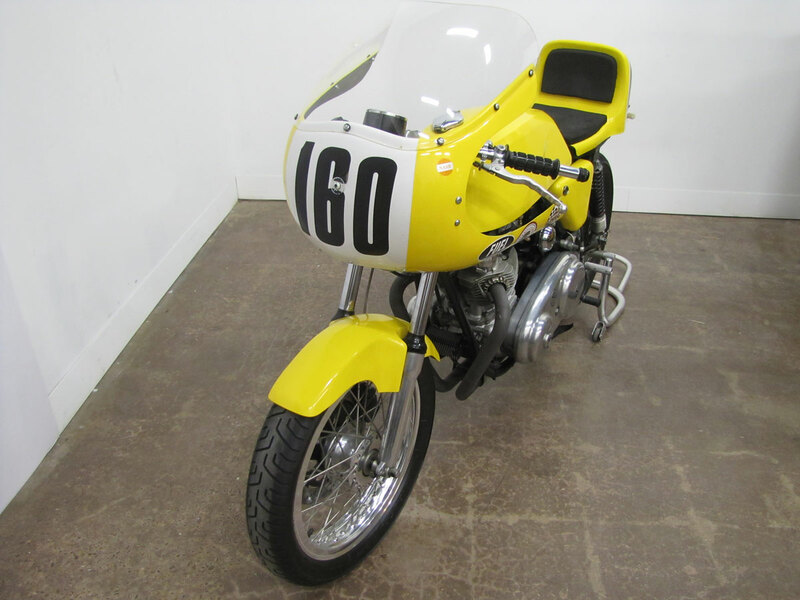 After a string of 500, 600 and 650 twins, in 1968 the 750 Commando debuted as the Fastback, a sort of cafe racer with sleek fiberglass bodywork. 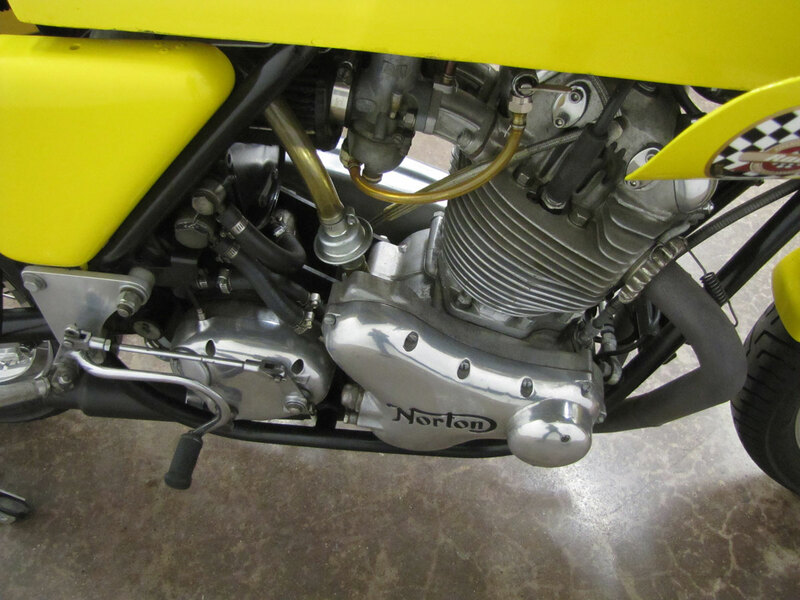 While previous Norton twins had vertical cylinders, on the Commando Norton sloped them forward lessening the engine’s overall height and placing more weight on the front wheel. 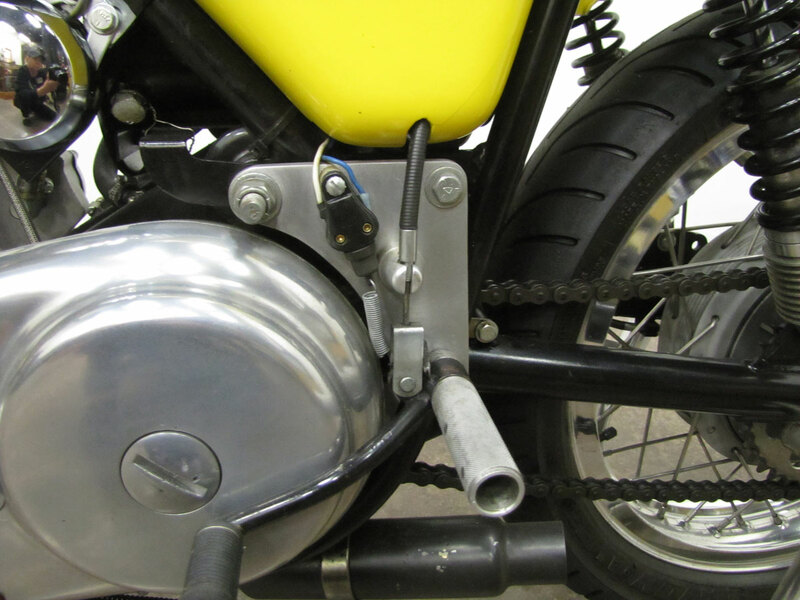 Good for handling. 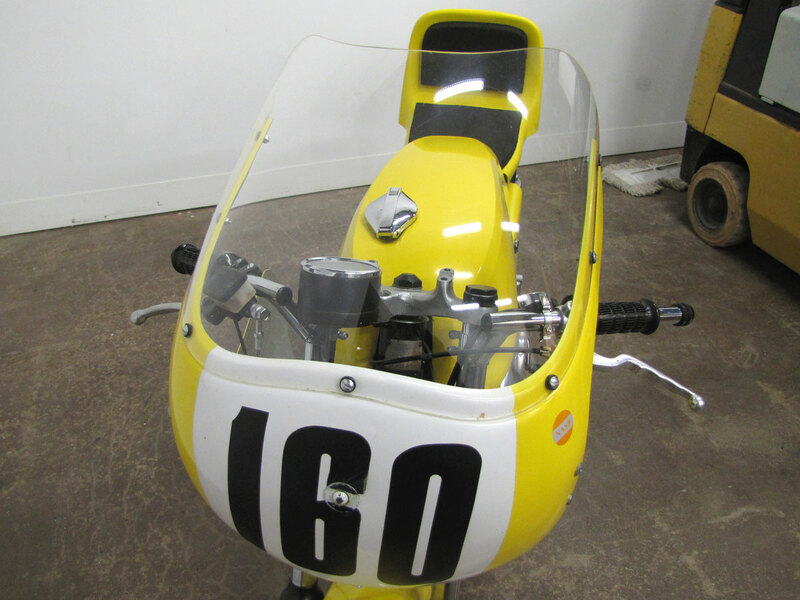 John Gregory, long time racer and owner of Sunset Motors in Kenosha, Wisconsin, opened in 1959, has road raced several Nortons and a few Ducatis. 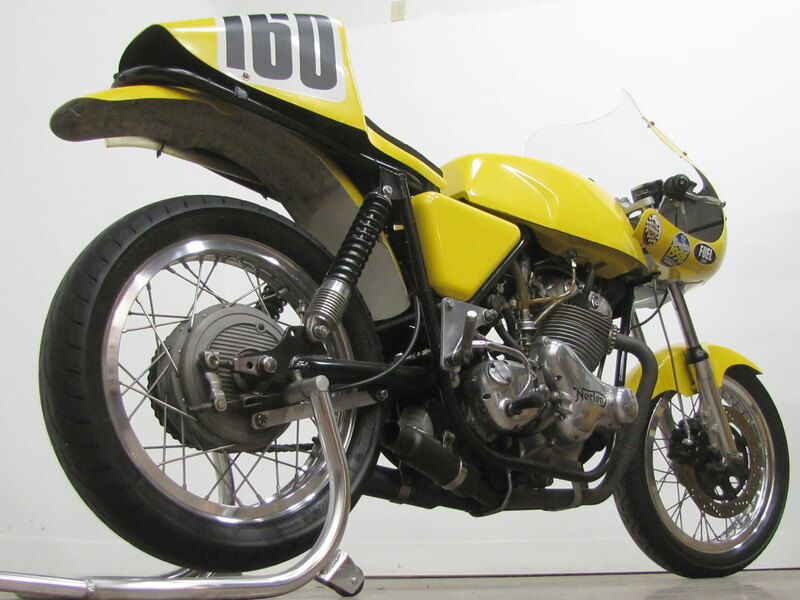 About 20 years ago, when John was 65 and still road racing with AHRMA, he built this Commando from a rusted hulk found in an alley, a tip from a short wave radio operating friend. 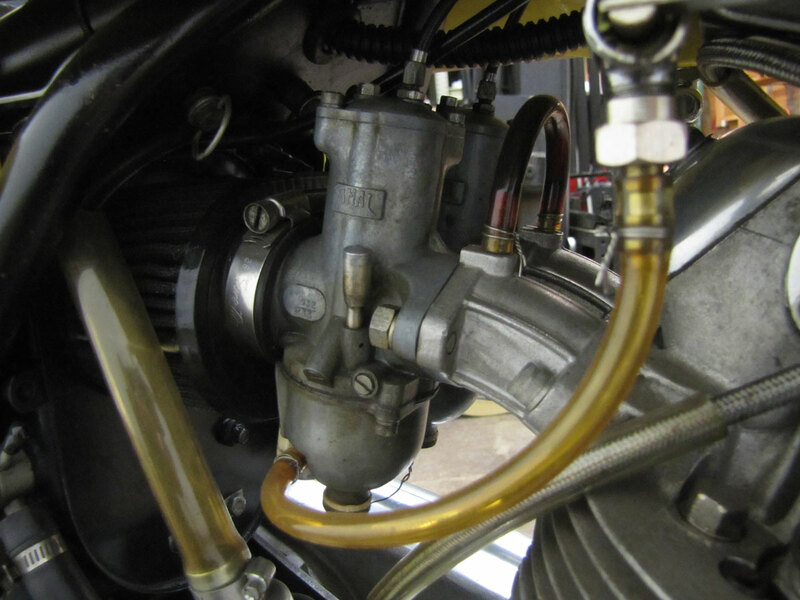 During the rebuild, the stock head was used and just a cleanup hone was done on the cylinder. 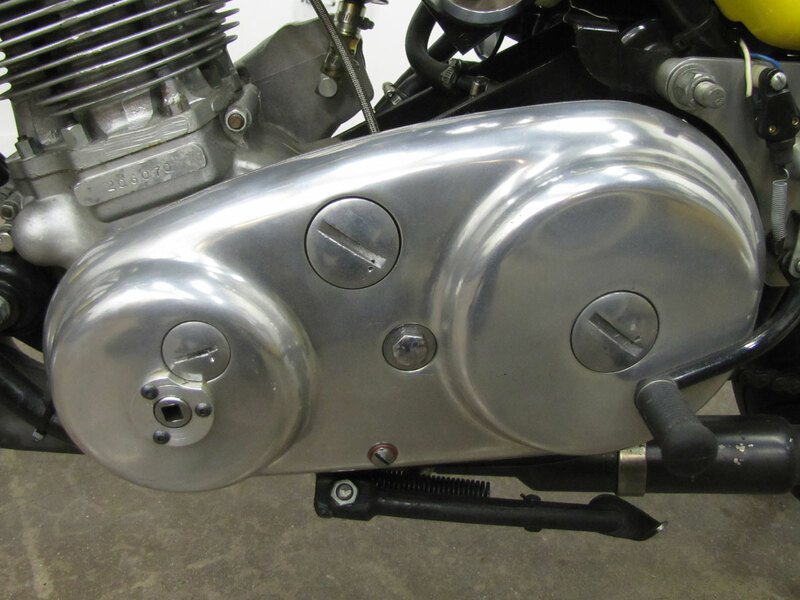 As John and TC Christianson had done to improve cylinder durability, extra through studs were installed to anchor the head, which was milled .060” for a 9.5:1 compression ratio. 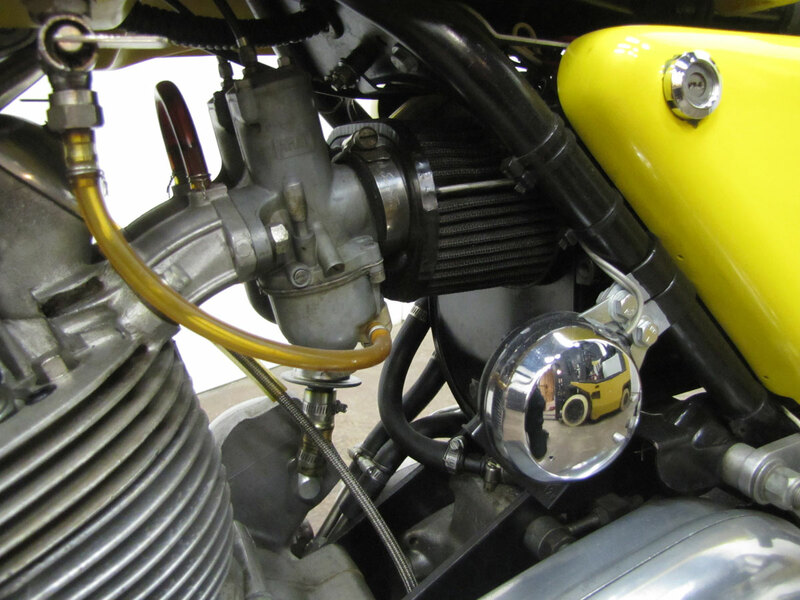 The camshaft is from Norris. 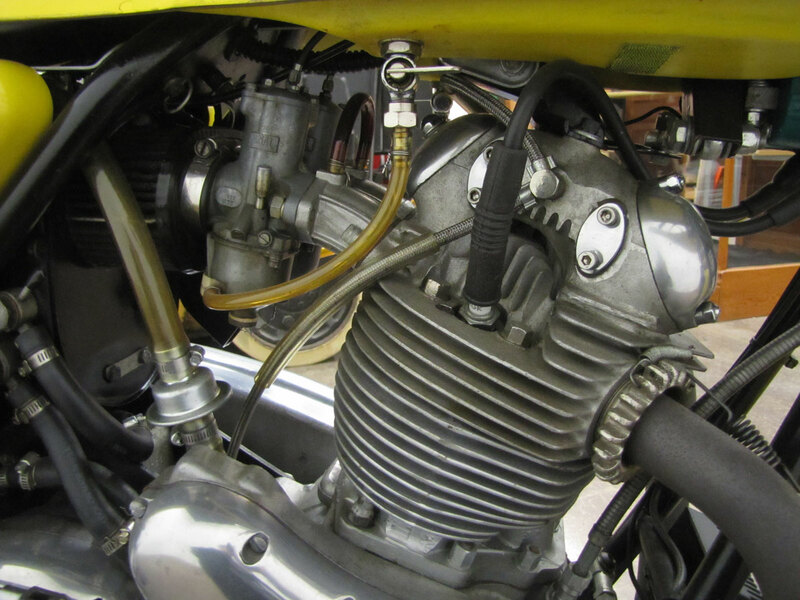 John upped the Amal carbs to a 32mm like the Combat used in 1972. 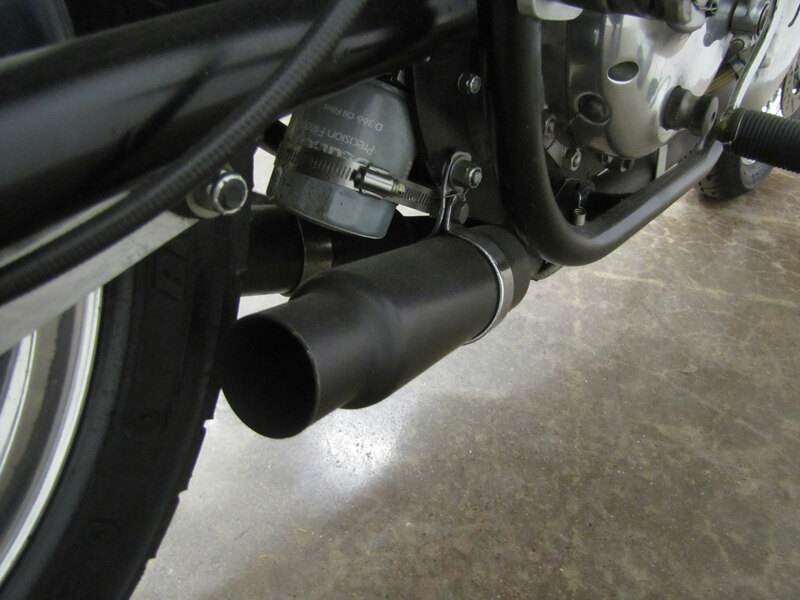 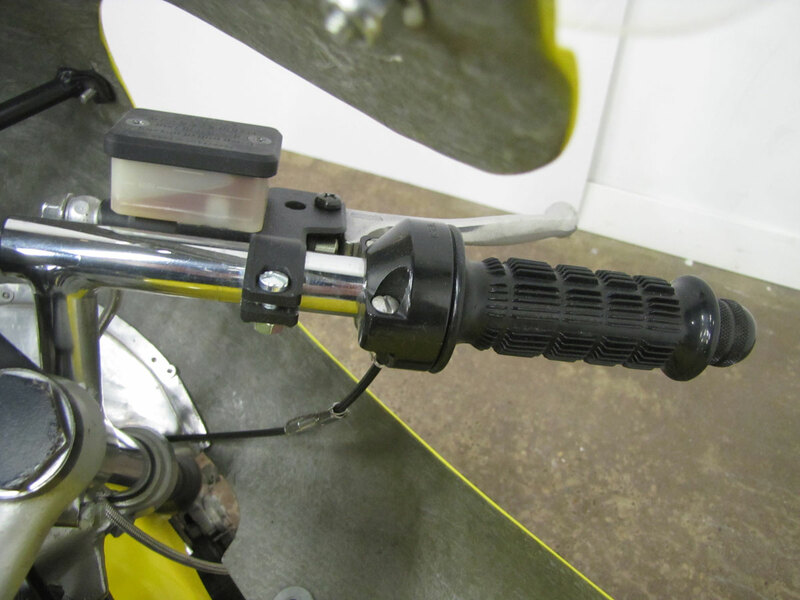 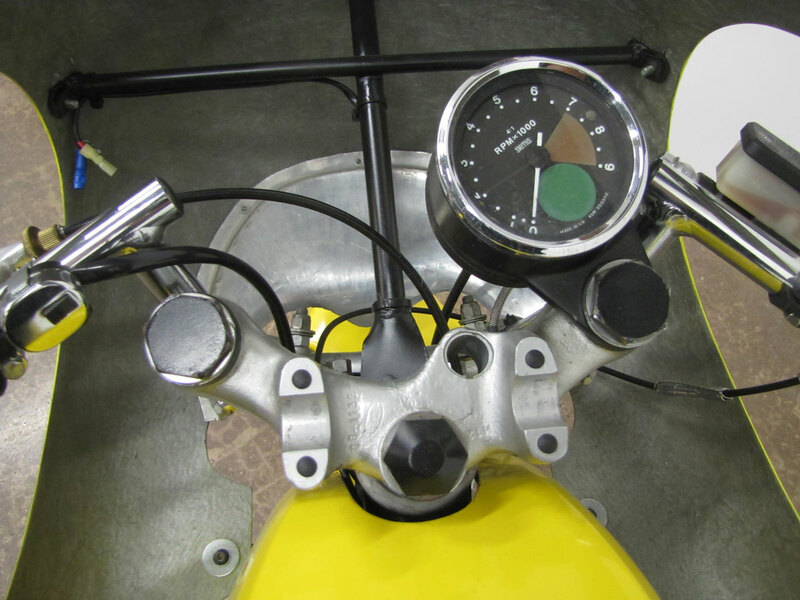 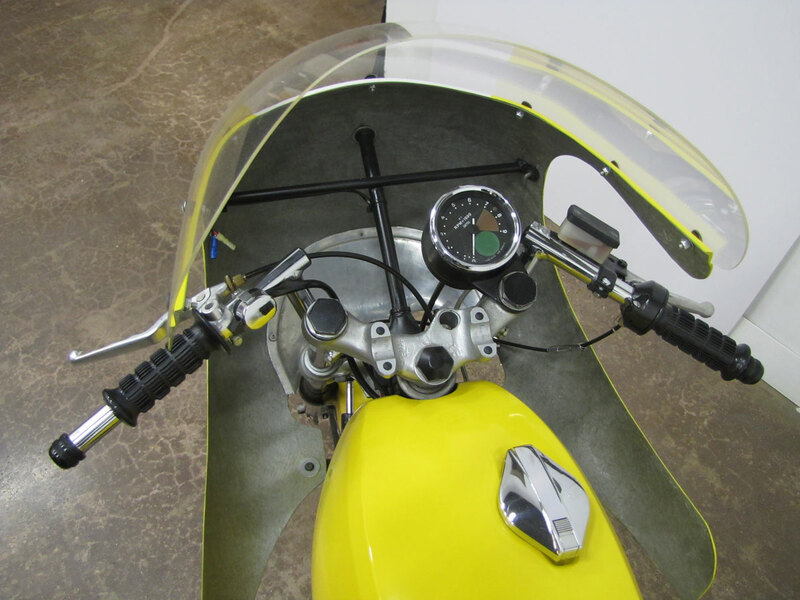 The Dyna ignition setup required a Sportster regulator; negative ground. 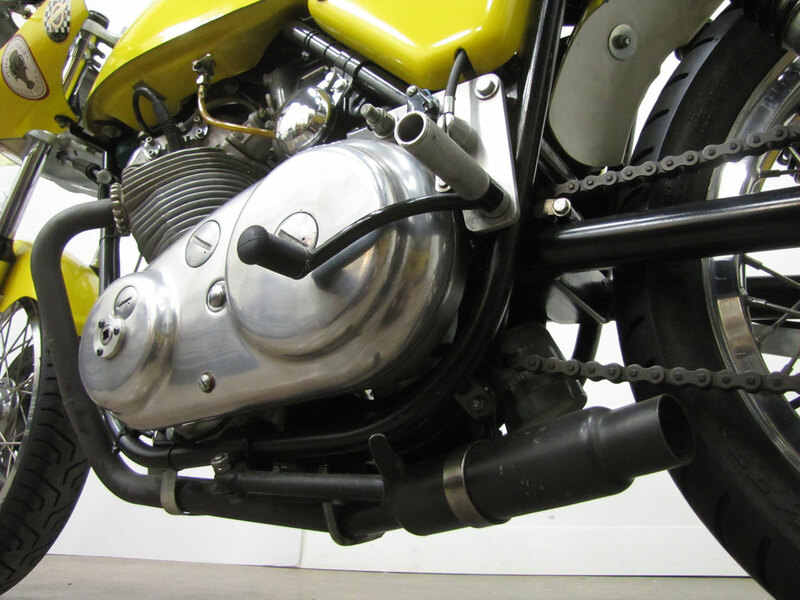 Pipes are hand made, 1.5 inch tubing. 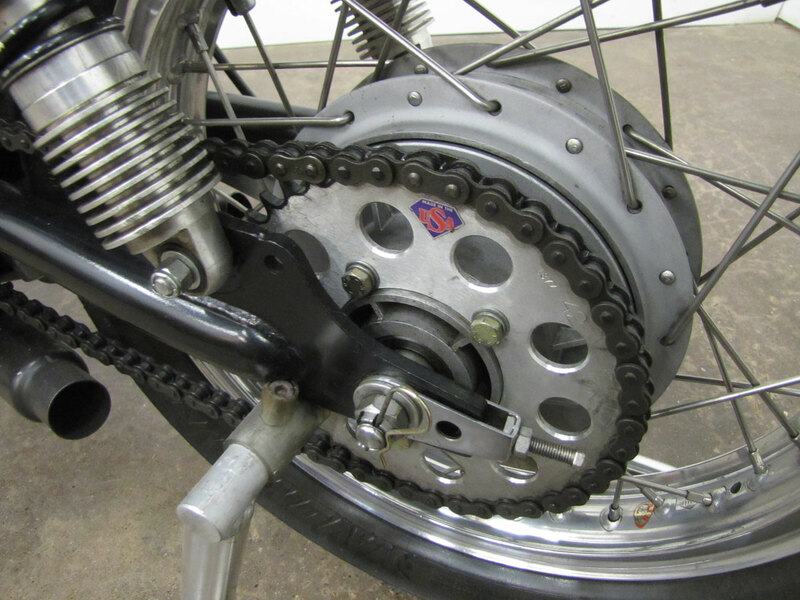 The transmission is from an 850 Commando which uses tougher gears than the 750 but the stock chain primary is in place. 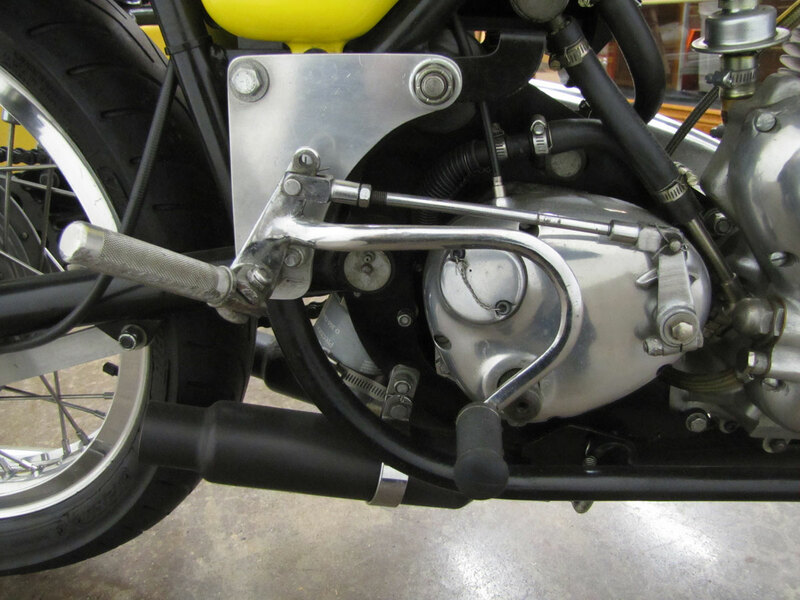 The engine is located at the top, front and rear with Erik Buell-designed Heim joints which John says make the whole bike more rigid than the stock Isolastic setup. 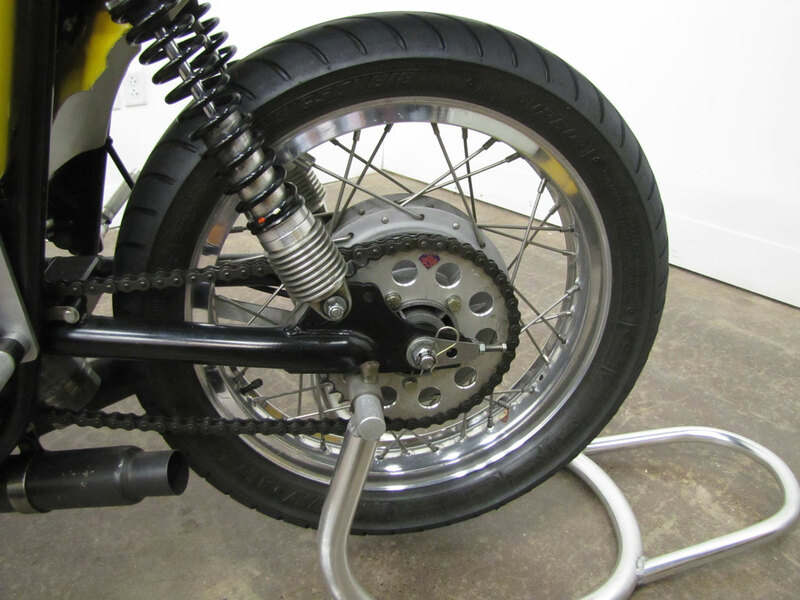 Moving to the chassis, the wheels are 18 inch replacing the stock 19’s which are difficult to get race rubber for. 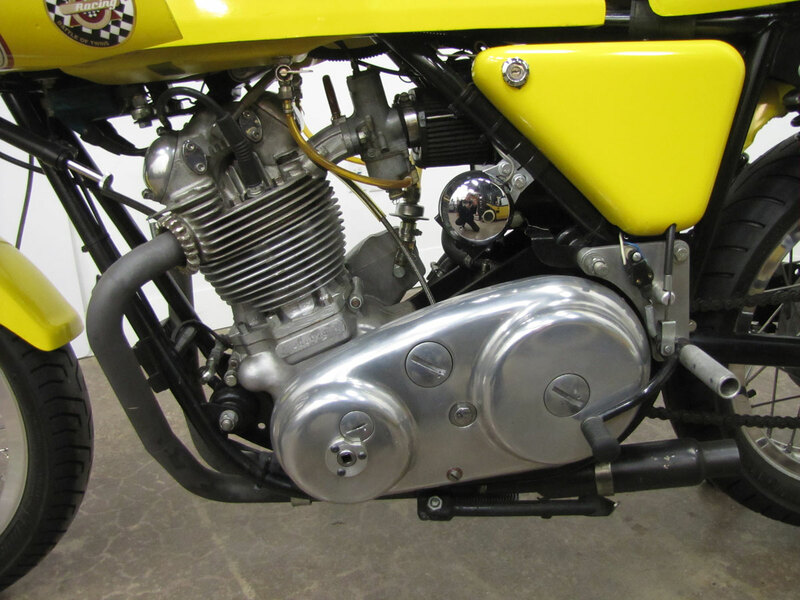 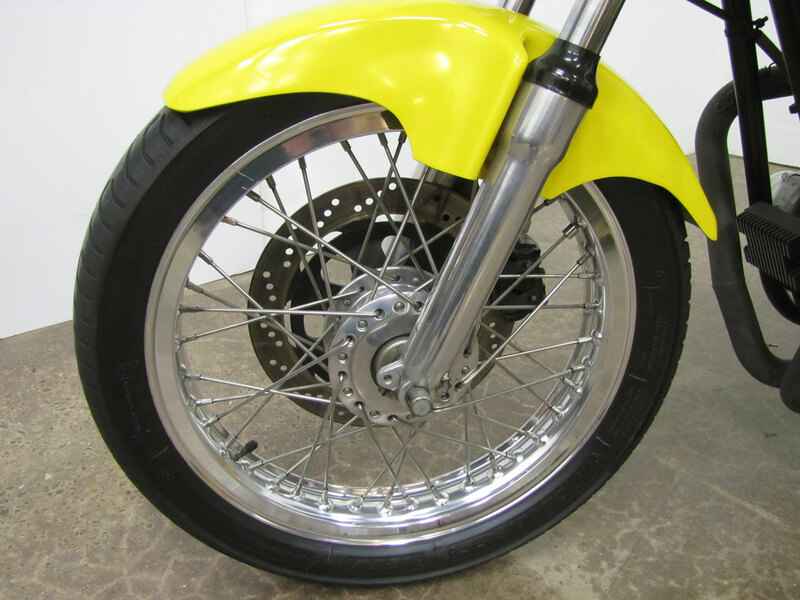 An 850 Commando swing-arm, more rigid, is used and John made his own rear-sets. 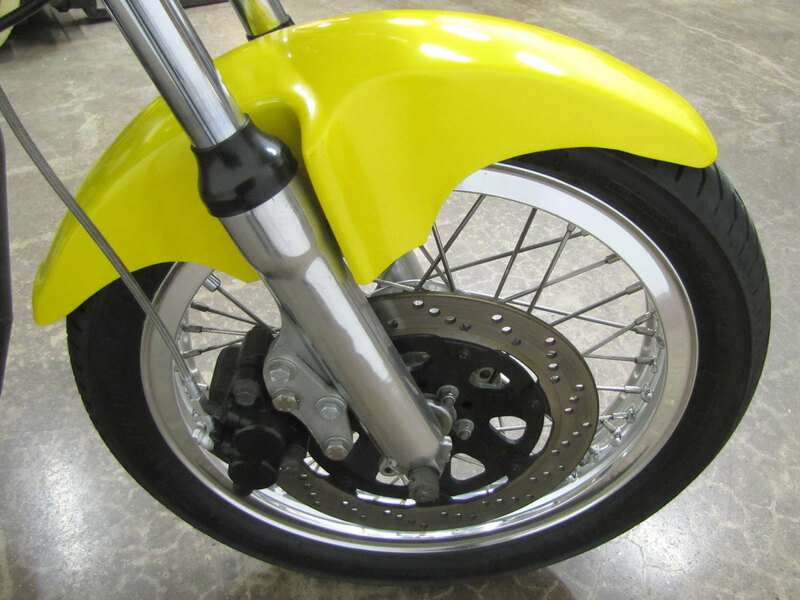 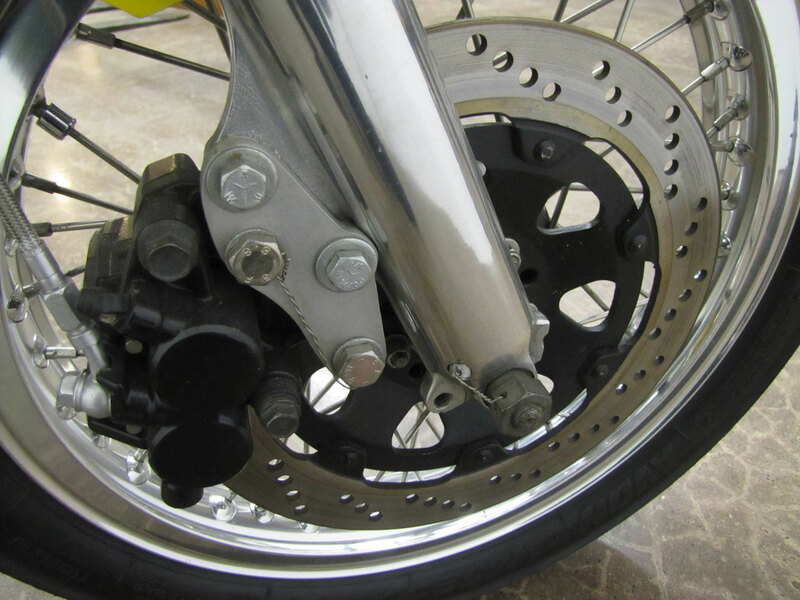 The front brake is a two-piston Gold Wing caliper with a Suzuki rotor, master cylinder is generic German. 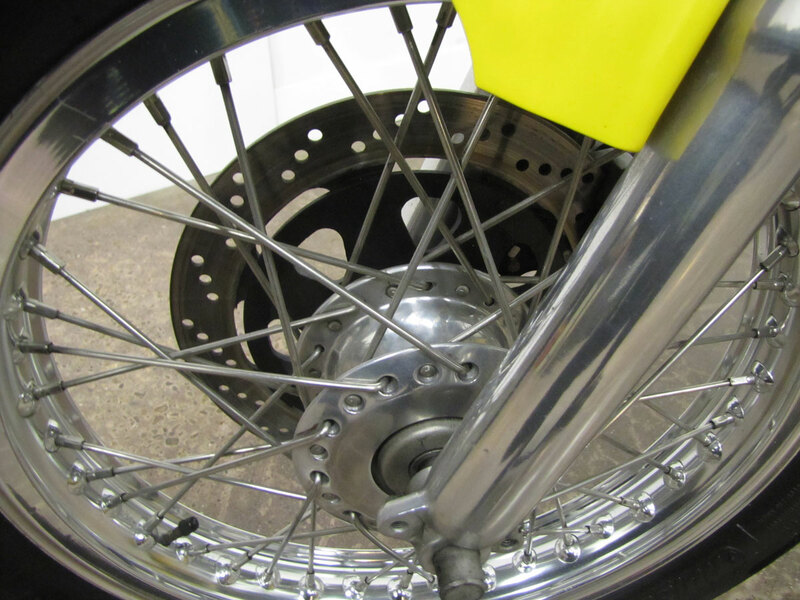 John says the Gremeca drum rear brake which he employed is much better than the stock Norton iron piece, has great feel and allows for quicker gearing changes. 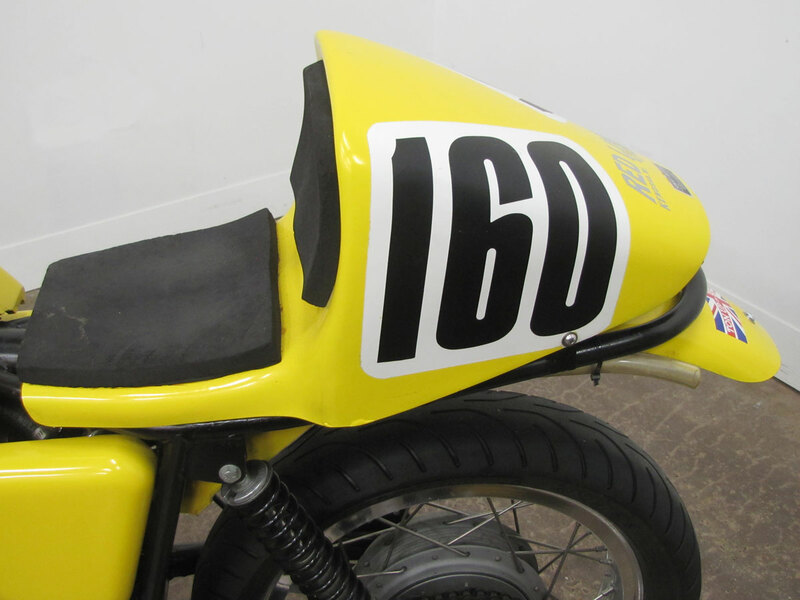 Most of the body work is Norton Production Racer replica, but the seat came off a Harley that the factory was wind tunnel testing around 1967/1968 for their KR750-based road racers. 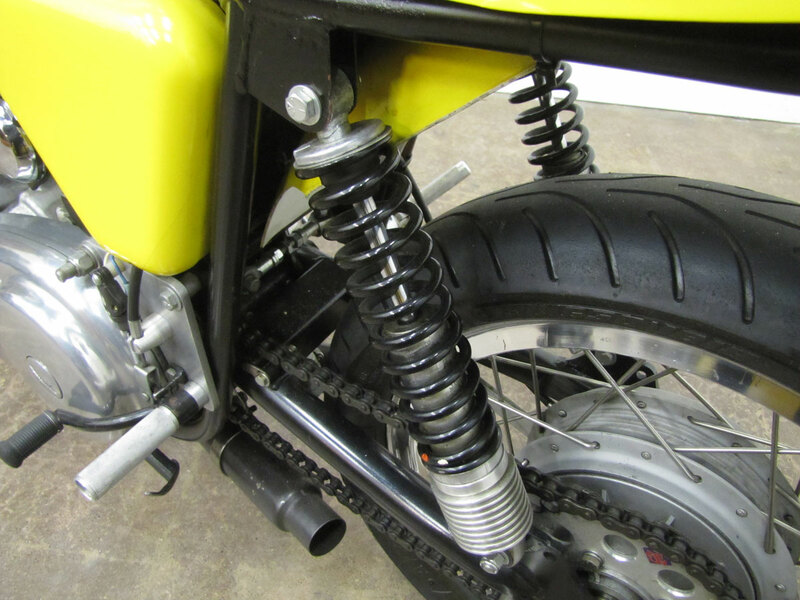 John used stock Norton forks, but stood up the longer rear Koni shocks, more like a Featherbed Manx. 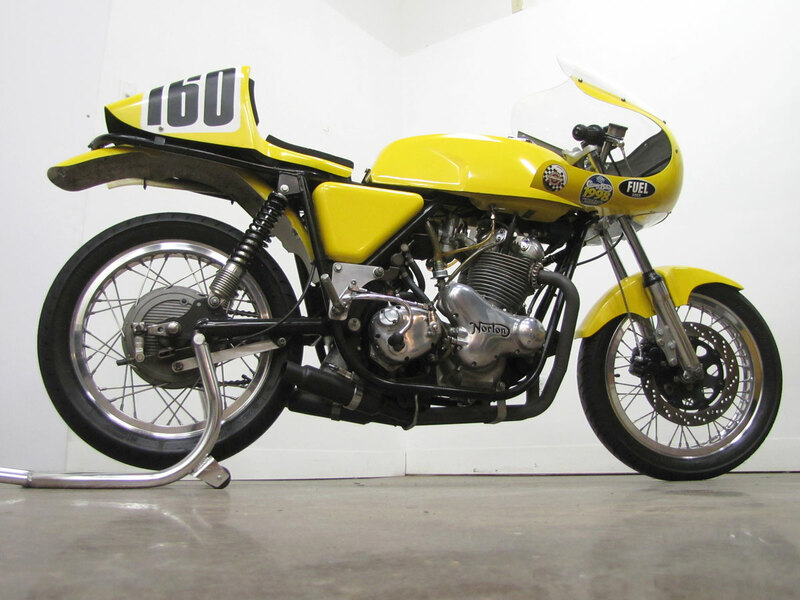 The Konis were from his 1967 500 Norton racer. 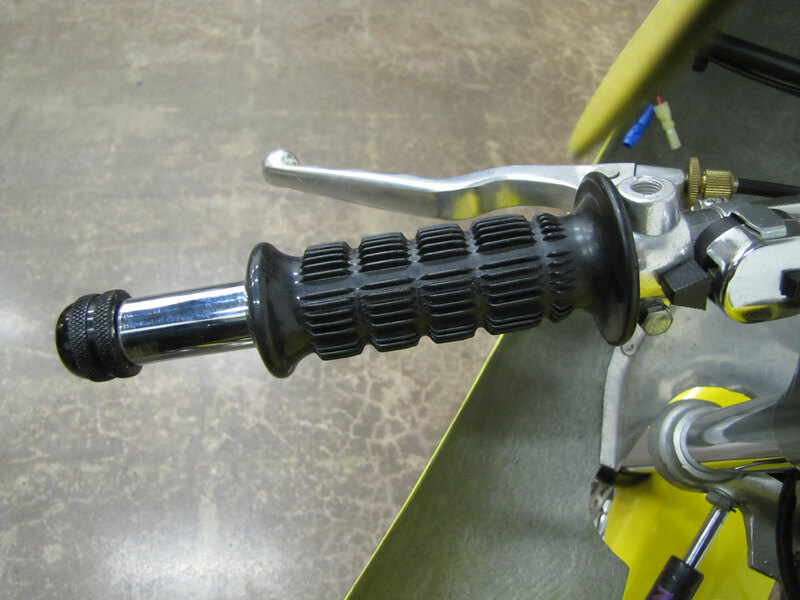 In the end steering is a bit quicker than stock. 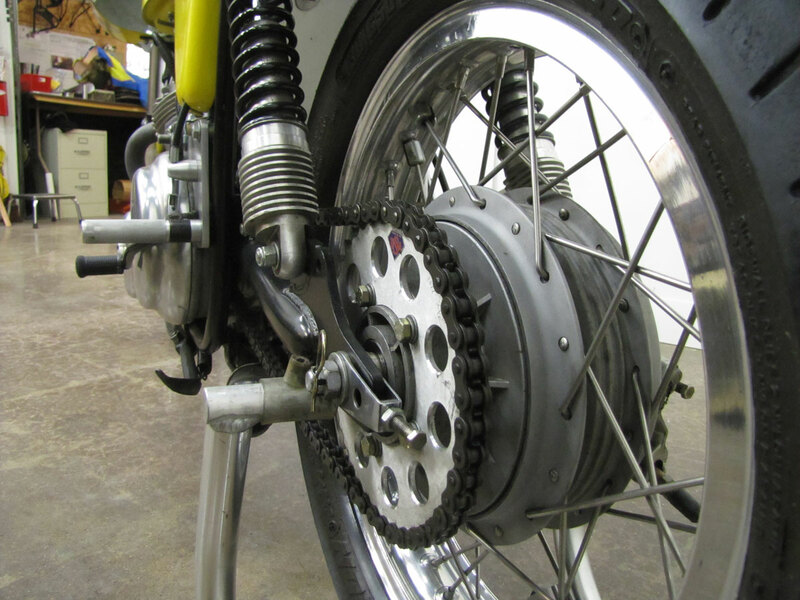 John raced the Commando about ten times in 1998 and 1999. 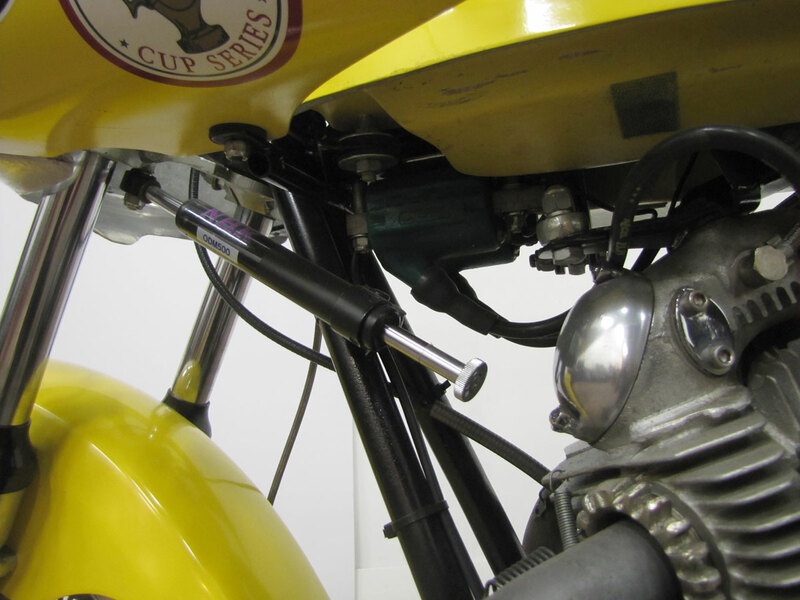 At Daytona in October 1999, he was involved in a turn one crash which ended his racing career. 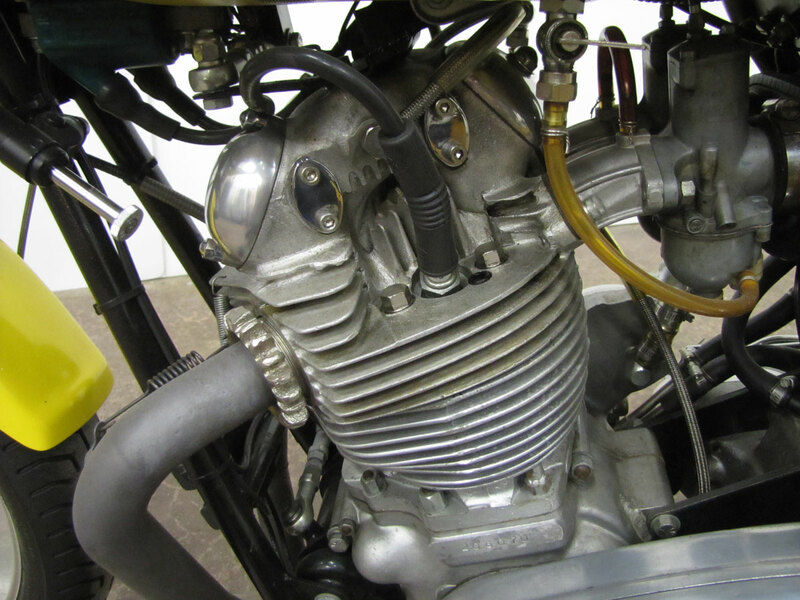 Surprisingly, the heart of the Commando is a big, old fashioned pushrod twin, non-unit, truly outdated by 1968. 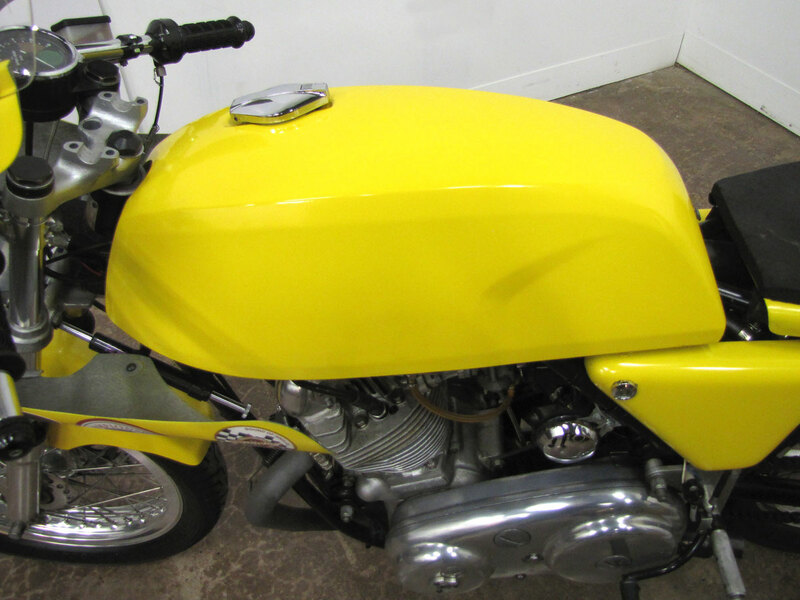 But maybe the fine chassis made up for that? 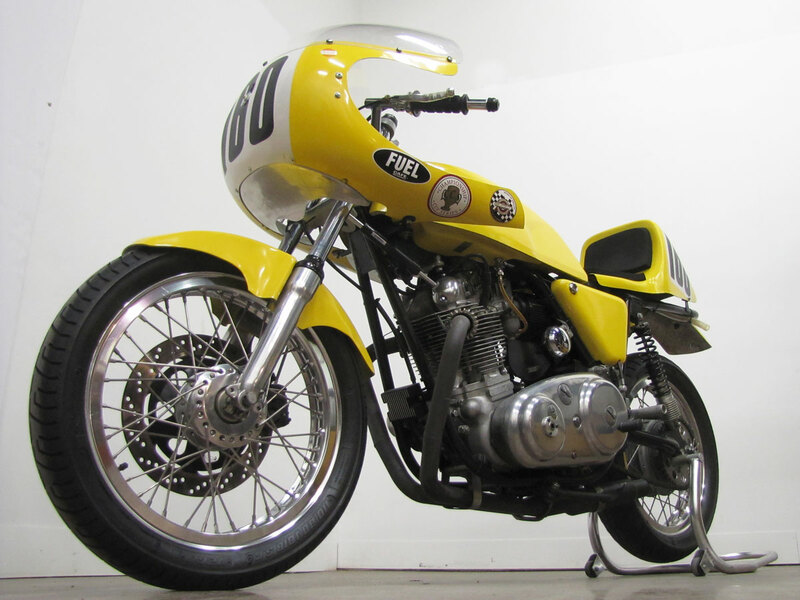 When CYCLE magazine tested seven Superbikes in 1970, two years into Commando production, the Norton was quickest in the quarter mile. 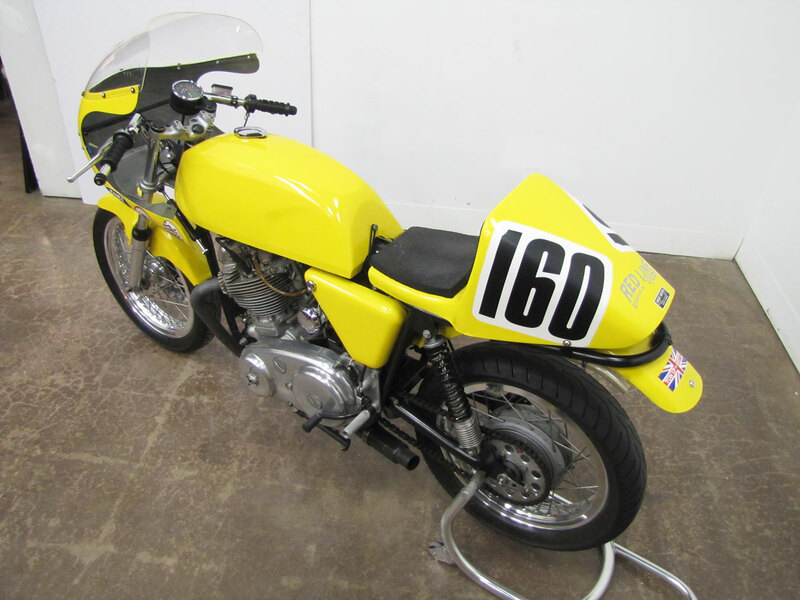 This surprised many who figured the Harley Sportster would win the match or maybe one of the British triples new to the scene, or the Kawasaki H1 or Honda CB750 which eventually got a drag slick during the road test! 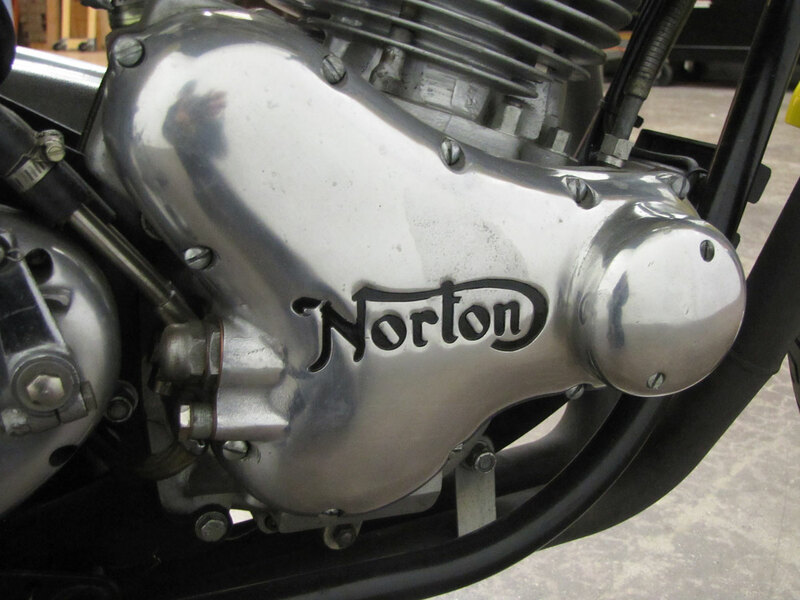 Testers also found the Norton easy to ride at speed. 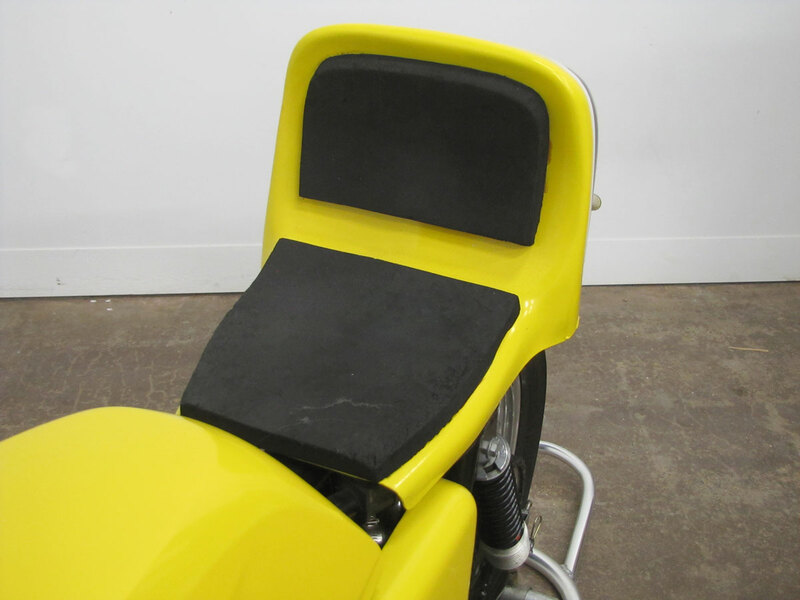 “Handling is extremely light and precise for a big machine,” Cycle said. 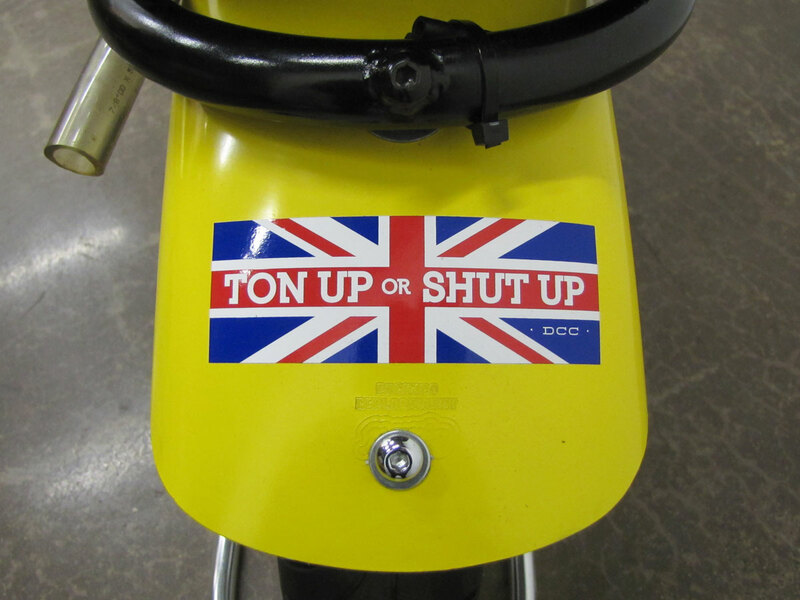 Maybe it was not so outdated after all! 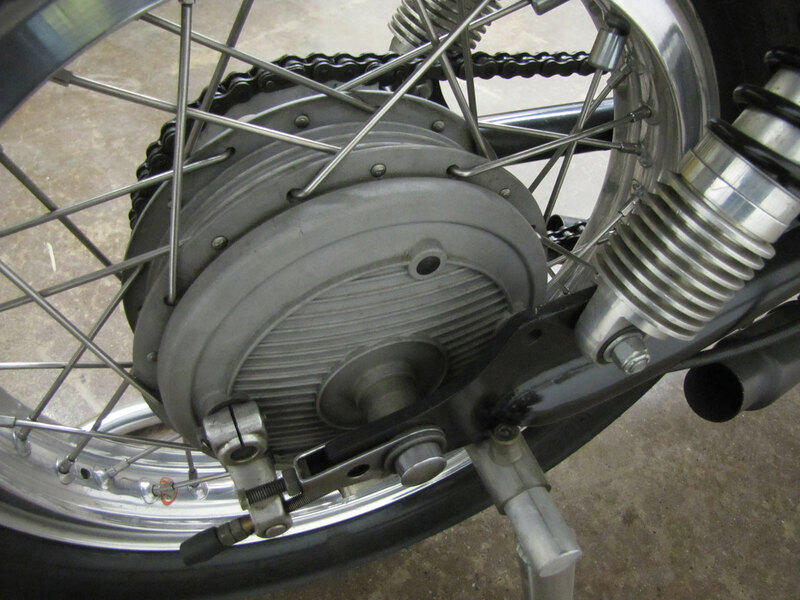 John Gregory is also known for his engineering work and invention of the “slipper clutch” that gave T.C. 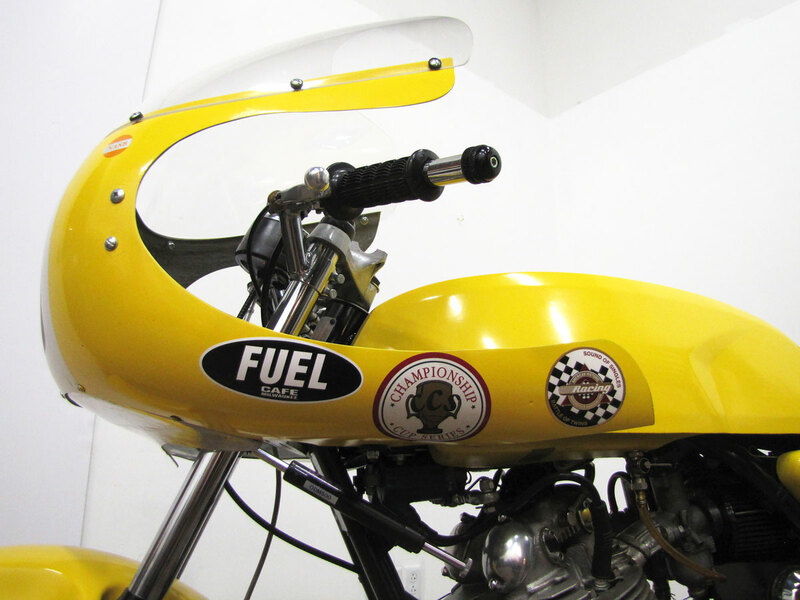 Christenson so many wins on his double engine Norton top fuel drag bike, HOGSLAYER currently on display at the National Motorcycle Museum in Birmingham, England. 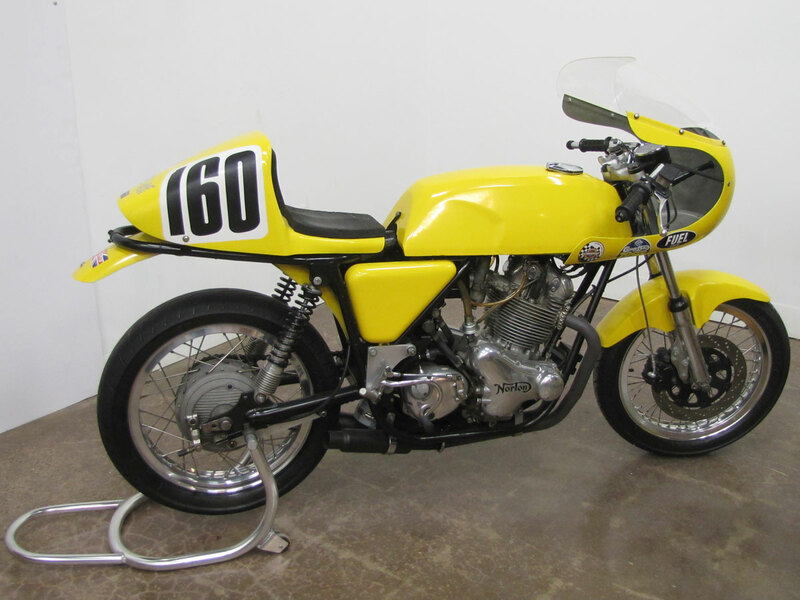 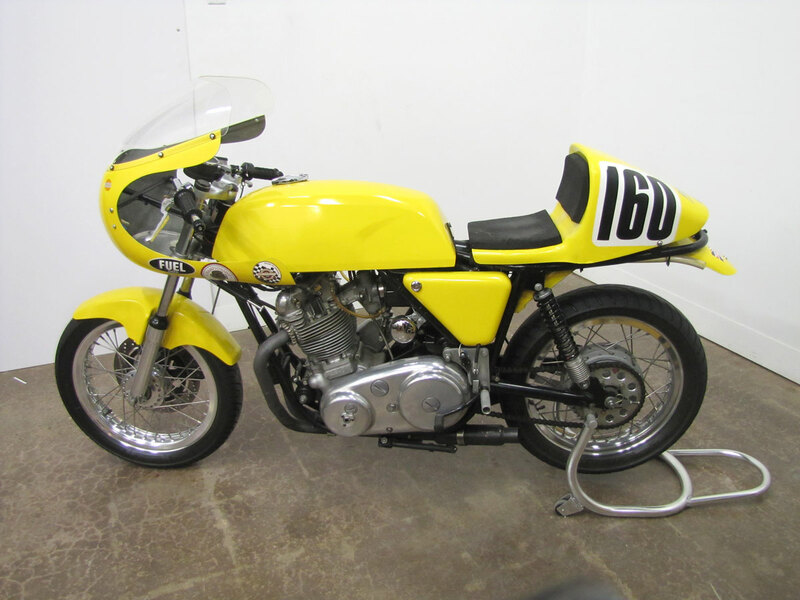 Stateside, in Iowa, John Gregory’s Norton is in a grouping of about a dozen road racers from a thirty year period. 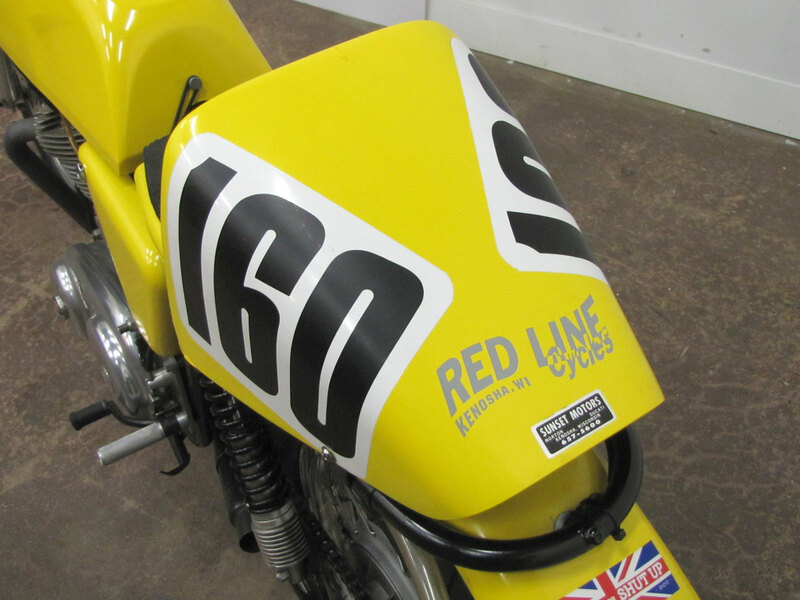 They include a Harley KR750, a BSA Gold Star, an Aermacchi 250, a Buell and even a Parilla. 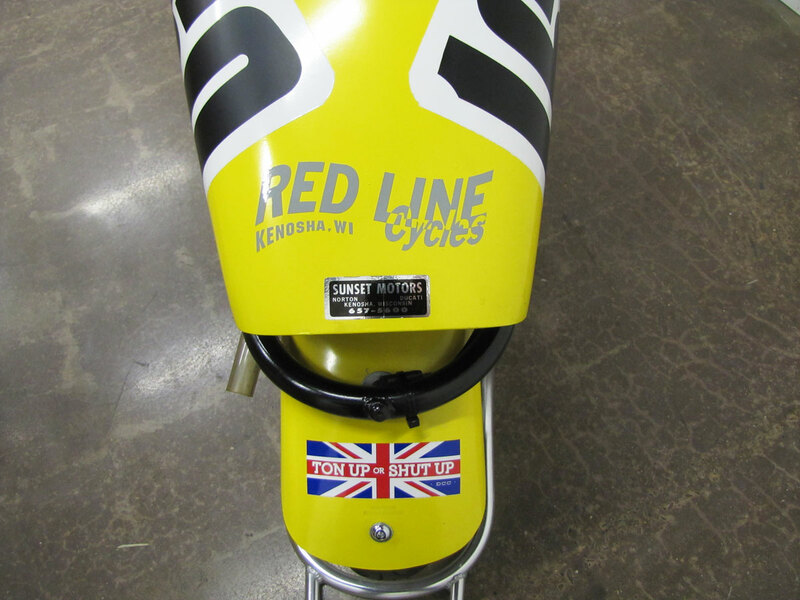 John is a Special person !! 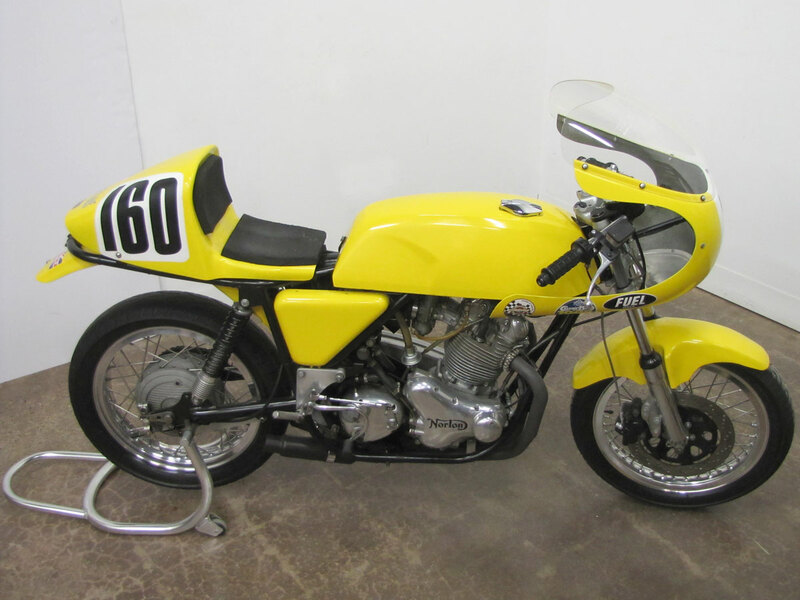 I was surprised and pleased at the time that Commando won the first Cycle superbike shootout – but it has been well established since that time that the bike tested was a “cheater”, and not what you were going to be getting from your dealer. 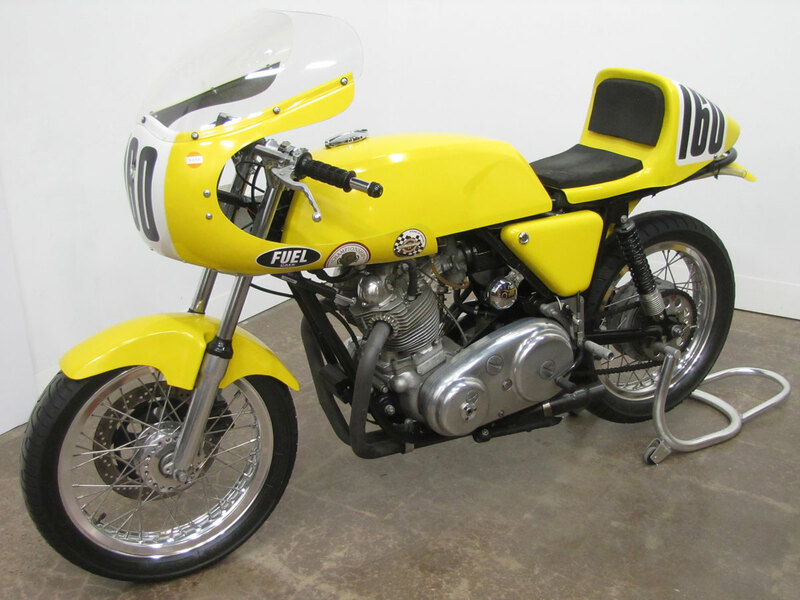 I’d still want that Norton today, though, and this bike and John’s efforts are justly honored.